Every beautiful wedding and marriage should start off with a beautiful proposal but unfortunately this is not the case. It is suggested that 20% of women were disappointed with their proposal, which is not the way you want to kick start the rest of your lives together. There’s nothing worse when you and your other couple friends share stories, your engagement story falls short of magical and absolutely perfect. 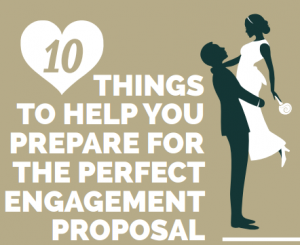 That’s why Diamond Heaven has put together a guide, 10 Things to Help You Prepare For The Perfect Engagement Proposal, which looks at all aspects to asking that all important question. But why do I need this guide? How difficult can it be? Well, what could go wrong? Simply drop on one knee and pop the question. With that frame of mind, you’re not going to pull off the perfect proposal; especially seeing that you’ve not considered the how much planning and plotting is needed. If you’re asking someone to spend the rest of their lives with you, you’d want to put some effort into popping the question. It is one of the most stressful times in your relationship and is as difficult to coordinate as a wedding, especially without the help of your other half. Let’s take the engagement ring as an example. Do you know her ring size? No? That’s fine, no many boyfriends do but do you know how to get it? Can you get it without her knowing? It’s not a perfect proposal if she sees it coming and nothing will kill the moment than finding the ring is too small or too big, then there’s the embarrassing trip back to the jewellers to change it. How can you get her finger measurements without her knowing? Then there’s asking her parents, your future in-laws. 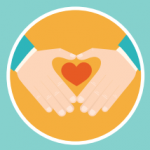 Asking your future bride’s parents permission for her hand in marriage is an aged tradition. Maybe a bit too old fashioned. That in mind, you’re most likely asking yourself, do I need to do this? This is the twenty first century, why do I need to ask for the parent’s permission? If I want to, how do i go about it? If I don’t, what’s the worse that can happen? Most importantly, this guide covers, how to know she’s ready? Well, how do you know? She could be the one, want to spend the rest of her life with you and make that commitment but when she’s ready. You don’t want to ask when she’s not ready as it could mean she says no or says yes but she goes into that commitment unsure. So how do you know she’s ready? What are the tell tale signs? How can you be sure? Diamond Heaven’s proposal guide covers those points and more in a simple but detailed guide with many tips and pieces of advice to creating the perfect proposal. It is a vital tool in preparing you to ask the most important question in your life.